Be sure to visit the main site, whose mission is to tell you the names of the mountains you can see when you're standing almost anywhere in the world, and the general FAQ, which lists all the features HeyWhatsThat has to offer. Follow us on Twitter and sign up for our occasional email announcements. If you're interested in the night sky, you may want to take a look at our planisphere (FAQ) site, where we overlay your horizon and the planets in the desktop version of Google Earth. We display an image of the Earth on the left of the page, an image of the night sky on the right, and a timeline along the bottom. On the Earth pane we mark the current viewer location with a purple X. For total and annular solar eclipses, we also show the path of the Moon's shadow's umbra across the Earth's surface: the dark disk marks the area that sees the full eclipse at any given time. On the timeline a vertical line marks the moment represented in the sky. For solar eclipses, we mark the timeline with a purple X if we can determine the maximum eclipse for the current viewer location. 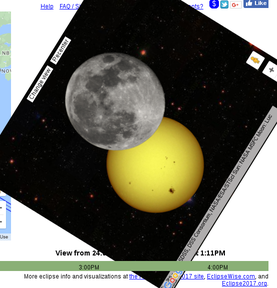 For a solar eclipse, if you shift-click or ctrl-click on the earth map, we'll try to set the timeline to the moment the eclipse is at a maximum at that location. Click on the timeline to set the time. For a solar eclipse, if you shift-click or ctrl-click on the timeline, then we'll also try set the location to the place on Earth that would see the eclipse at its maximum at that moment. Click on the play or pause graphic at the left edge of the timeline to start or stop the animation. In the bottom right corner, the "other eclipses" dropdown menu lets you switch to any eclipse from 2009 to 2020. For the August 2017 solar eclipse, use the NASA button at the top-right of the Earth map to overlay NASA's prediction for the eclipse path. The overlay is available at in the Downloadables section under Resources at the NASA Total Eclipse 2017 site. The default sky map is displayed using Google Maps with a Mercator projection, just like the Earth map. It's oriented with the celestial equator horizontal and the North star at the top. This will seldom match the orientation of the sky at your location; the Change view button rotates the map so that your local horizon will be horizontal and moving up on the map matches looking upward in your sky. This view keeps the Sun centered in the window and places the Moon as it will appear at the given time and location, eg. up is towards the top of the sky, not the North star. Here we rotate the Google Map so up is towards the top of the sky, not the North star. We'll keep working on this and we welcome suggestions as to how to make it more intuitive. Position data for the Sun, Moon, planets and asteroids is obtained from the telnet service of NASA's Jet Propulsion Laboratory HORIZONS System. We use geocentric positions for the Sun and Venus, but topocentric positions -- based on the viewer location set in the Earth pane -- for the Moon and Earth's shadow and closely approaching asteroids. Our computations generally come close to NASA's, but they are not identical. 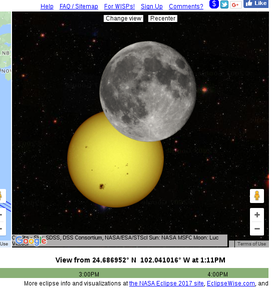 For precise eclipse timings and locations, visit the NASA Eclipse web site. The images of the Sun and Moon are fixed and do not reflect their current conditions or orientation. The Sun's surface is actually very dynamic; you can see current images at spaceweather.com. The precise area of the Moon visible during a full Moon varies as well. For the Earth's shadow, we compute the radius of the Earth's shadow's umbra and penumbra at the distance to the Moon, and draw the penumbra with a 50% gray, 50% transparent PNG and the umbra with a black, 50% transparent PNG. In the computation we use the radius of the Earth at latitude 45° and apply Danjon's empirical rule of increasing the radius by 1/85 to account for the Earth's atmosphere. The images of the Sun, Moon and planets were found by browsing the NASA Planetary Photojournal, Wikipedia, and the Wikimedia Commons. We converted to PNG, cropped the planets and made the backgrounds transparent, and reduced sizes. 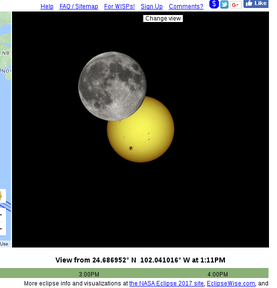 The Moon image used for solar eclipses and the Venus image used for the transit are darkened from the original. The image used for the February 2013 close approach of asteroid 2012 DA14 is actually of another asteroid, Ida, and is shown about 10,000 times larger than 2012 DA14. Here are the sites where the images can be found and credits as they appear on those pages. Uncredited images are from the NASA Jet Propulsion Lab, the NASA Marshall Space Flight Center, and the Wikimedia Commons.